Are new stars dark until their photons reach the surface? Can we measure how fast do neutrinos travel? Are all the implications of General and Special Relativity understood? Previous questions show (that caused so much distress!) about accelerating matter. Shouldn’t the Universe be Absolute Zero everywhere? What can’t human eyes see in the Electromagnetic Spectrum? How can we measure the rotational rate of galaxies since they are rotating so slowly? Is it possible there is no Dark Energy and we are just in a cosmic void? What is our velocity relative to the center of the galaxy? Dynamical Models of the Inner Milky Way — Dehnen and Binney 1999. If space is a vacuum then the speed of light should be without limit. So what limits the speed of light? Fraser Cain: We’ve recorded four episodes in three days. Time is all relative now. Einstein would have to figure this out [laughter] we’re going to record a few more episodes because you’re going to be traveling. Dr. Pamela Gay: Yeah, recording at the speed of sound. Fraser: Before I go into the questions I want to remind people a couple of rules for the questions. I have refined them a little bit. The first one is just one question per e-mail. We’re still getting kind of like three questions at a time. The way this works there are so many questions, literally we get ten questions a day probably. We can only answer about fifteen a week and so they’re piling up. If you put in three questions in your email I have to bump out two of them and keep my favorite. If that’s okay with you, if you’re alright with me and Pamela choosing which of your three questions is the one we want to answer then that’s fine, but just send one per e-mail. The second thing is we sort of avoid the heavy calculation ones just because they require a lot of Pamela’s time to calculate. Usually we’ll only throw in one or two of those in a week. If you’re asking a question that requires some calculation there are some great ones that require a lot of calculation that I would love to answer. Pamela: When you send us a question that would require me to do a second doctoral dissertation we’re going to procrastinate. Fraser: Yeah, we’re going to push it down no matter how cool the question is. Pamela: Life is short and we’ll get there eventually but I have six research papers ahead of the question you’re asking. Fraser: Now you might get a Nobel Prize for it but these things take time. Pamela: Yeah and I prefer computational to calculus. Fraser: The ideal kinds of questions are the ones where we can handle them more not computational, not calculating, more just sort of discussing broad themes and such. Let’s get on. Are new stars dark until the photons reach the surface? How fast to neutrinos travel? What’s the story with Hawking radiation? William Stewart from Chester, UK asks: I understand that a new star is formed when the temperature and pressure at the center of the collapsing gas become high enough for sustained nuclear fusion. I also understand that it can take tens of thousands of years for a gamma ray photon to randomly walk its way from the center of the star to the outer surface. 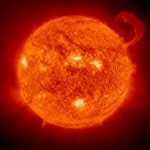 Does this mean that if a new star is forming nuclear fusion would go on inside the star for tens of thousands of years before the star itself begins to shine? I guess what William is saying and we’ve talked about this before the nuclear fusion inside the star produces gamma rays and the gamma rays are emitted and absorbed many, many times. Pamela: Changing color as they go in a lot of cases. Fraser: Right and they make this long walk from the center of the star to the surface. When they finally emit from the surface there’s a visible light that we can see. But a single photon can take a hundred thousand years, maybe even more to go from the core of the star where the fusion happens to the surface. Is this true? Will we get a situation where the gas will get to the point the fusion will ignite but then you still have to wait about a hundred thousand years before you see the light from the star? Pamela: Well the question is when do you see light from the star and when do you see light from the particular nuclear reaction. From any given nuclear reaction you might have to hang out and wait a good long time. But the star itself is formed from many different reasons. One of those reasons is just it is compressed. When you compress gas it heats up. The same way that when you let it expand out of like a can of air that you might use to dust your computer that expanding gas cools. Compress that exact same gas back down and it’s going to get hot. Stars just compress gas and it thermally heats up through this process. You see that thermal heat, that infrared heat, that radio heat well before you start seeing the light from the nuclear reactions in the core. The star will actually start to shine before it starts to have nuclear reactions and then even before you start to be able to see those nuclear reactions. Fraser: In many cases when the stellar nebulas first come together and you’ve got that first I think it is a couple of hundred thousand million years after the protostar is formed you’ve got a pretty hot object that’s purely heated from the compressing gas. It is visible to telescopes and I think you may even have a hard time to tell the difference between the star and when the fusion finally comes out. Pamela: You can tell. You do get a color change when you start to get the nuclear reaction. This is where the star goes from being a pre-main sequence to a main sequence star. It is a gradual process and the exact moment is just a turning point that you don’t really see until you’ve had a chance to watch the star for awhile. Fraser: Right so some photons would a little quicker, some would take a lot longer. The star would change in color over time. Then it is mostly now the light is coming from the fusion where before it was mostly coming from the heat. Pamela: The entire star becomes a specific temperature and hangs out at that temperature for awhile once you have nuclear reactions going in the core. Fraser: Right. Okay Carlton Brown from Maine asks: Neutrinos were originally assumed to travel at the speed of light and to be massless. It now appears that neutrinos do have mass. Has anybody established what the neutrino velocity is? Fraser: Yes but neutrinos are the nearly massless particles that are streaming out of the sun. They can go through a light year of lead and not interact with any atoms. There are millions of them passing through your body right now. They do have mass? Pamela: Yes and that’s one of the coolest discoveries that has been made probably in the last ten years. There’s lots of really cool stuff that’s going on. This is one of the ones that fundamentally we finally knew something totally new and it answered a whole lot of questions. Since neutrinos have mass they can convert their total mass plus energy to allow them to go from having one amount of mass and one amount of energy to having a different amount of mass and a different amount of energy as long as the whole thing adds up to the same number the whole time. Because of this you can have one flavor of neutrino an electron neutrino decide I want to be a new neutrino. I want to be a neutrino. They go back and forth between these different types as they fly through space. This finally allowed us to understand why we weren’t seeing as many of one flavor of neutrinos we thought should from the sun. It was either we didn’t understand neutrinos or we didn’t understand the sun which was really, really disturbing. It turned out neutrinos have mass and that answered almost a hundred years of confusion and that’s just cool. Fraser: Back to his question then, what’s the speed? Pamela: The speed is almost the speed of light. If you take the velocity that they’re going minus the speed of light, divide it by the speed of light, you get a number that is pretty much one times ten to the minus four, minus five. We’re looking at a 10,000th – a very slight difference between the speed of light and the speed of the neutrino. This is entirely consistent with the very, very small amount of mass that they have. Fraser: Right, they’re going 99.9999 percent the speed of light. Fraser: Yeah, it’s because it’s not the speed of light. Pamela: That’s all that really mattered. What allows this to happen is we know how to make neutrinos. We finally know how to detect them with instruments like MINOS. It was the MINOS detector that ran this experiment. They let loose a beam of neutrinos and waited to see how long it would take them to go several hundred kilometers and you can measure that and we did and it’s cool. Fraser: Alright, Javid Bride asks: Hawking radiation – it seems to me that just as many regular particles would fall in as anti-particles bouncing up with the boiling effect. If energy is produced by the mutual annihilation of the particle and anti-particle and the energy does not escape the black hole wouldn’t it stay in and simply feed the mass? I’m going to try and do some explaining here. Stephen Hawking is the person who came up with the theory that black holes evaporate. You get these virtual particles appearing right at the event horizon of the black hole. Normally the virtual particles self-annihilate, you know it’s a particle and anti-particle but in this situation one particle goes into the black hole and one particle stays out. Because this happens it actually evaporates mass from the black holes. I guess what Javid is asking is, who cares? Shouldn’t [laughter] the particles just fall back in? It doesn’t matter whether it’s the particle or the anti-particle these particles should be actually adding to the mass of the black hole not evaporating. Pamela: I actually read this question differently. The way I read it is you should have as many regular particles escaping the black hole and flying off into the middle of nowhere as you have anti-particles escaping and flying off into the middle of nowhere. If you have as many matter particles and as many anti-matter particles escaping how does that change the mass? Pamela: Here the issue is – if that’s what he meant to ask – anti-matter and regular matter both has mass. An electron and a positron weigh the same amount. If they touch each other they release a huge amount of energy. If you could put a positron an anti-electron on a scale without destroying it and weigh it on the Earth it would weigh the exact same amount an electron weighs. Having anti-matter particles fly away decreases the mass, decreases the total mass energy of the black hole just as much as having a regular electron fly away. Whether you have a regular virtual particle or an anti-matter virtual particle, either one will decrease the total mass energy of the black hole. Fraser: Right, I see so if the particle falls in it just gets added to the mass of the black hole but because the anti-particle got away, it’s actually evaporating. Fraser: If the anti-particle falls in it probably strikes a particle and self-annihilates. The energy though is stuck and you get the same situation. Pamela: Right. Either way you’re losing some of the mass. It just may be more destructive mass or not. Fraser: Phil Harler from Chicago, Illinois asks: have all the implications of general and special theories of relativity been understood? Even beyond the difficulties reconciling with quantum theory, are there aspects of relativity that are still not fully grasped? Pamela: No. [Laughter] One of the wonderful things about science is you can never fully know what you don’t know. The more we learn about the universe the more we find interesting applications for relativity; interesting applications for special relativity. I don’t think that we can ever safely say to anything more complicated than what happens when you drop a rock on a 2 x 4? Anything more complicated than that I suspect will always have implications that we never fully grasp. Even dropping a rock on a 2 x 4, there are probably implications here on the planet Earth that something is going on at the quantum level that we don’t understand. Something is going on somehow that we don’t understand. We’re always gaining new information. We’re always gaining new understanding of the universe that we live in. It’s an ongoing process and we still have lots and lots left to learn. Fraser: You’re saying that there are aspects of relativity that are not fully grasped? Pamela: I am saying there are aspects of everything that aren’t fully grasped. Fraser: Right and there will always be and that’s all about science. Pamela: We’re still trying to learn so many different things. The more we study Mars the more we learn that there are plate tectonics and geology and different concepts that play on Mars and on Venus that we never imagined because of our understanding of the planet Earth. The more we understand about how planets form around other stars the more we realize there are things that we could never have understood just by looking at our own solar system. The more we study galaxies beyond our own galaxy the more we realize they come in stranger astrophysical patterns than we can see in our own Milky Way. The more we learn about everything the more we realize there are things we never thought of. The universe is way cooler than any science fiction writer ever imagined. Because of that there’s always going to be some implication that isn’t understood because no one thought to try and figure it out. That’s what keeps being a scientist interesting. There’s always some new question that you never even realized you were going to have to ask. Fraser: But weren’t there some predictions that were made by Einstein that theorists still haven’t had a chance to test out yet? Pamela: We’re still working on some things with Gravity Probe B. They’re hard to test so we’re still working on yes frame-dragging. We’re still working on some of the how many decimals can we poke things out to but we at least have the ability now to pretty much test all these predictions that were made. In terms of what are the implications of light always travels at the same speed to every observer. Just the question we had a few question shows back of if you take a 1 kilogram mass and accelerate it until its relativistic mass creates a short shield radius that is greater than the size of the 1 kilogram mass. One of our department’s best mathematicians who is a theoretical physicist is still struggling with that question. That’s a direct implication of special and general relativity that we can’t find someone who has solved the math for. There are lots of neat things out there waiting for someone to sit down and do the math, do the models, do the theories and understand the implications. Fraser: Alright, well then back at her, sorry Phil. There’s more to be discovered. [Laughter] Abduseved Ahmed from Saudi Arabia asks: how can the universe not be absolute zero everywhere? Shouldn’t it be absolute zero an inch above the supermassive hot star? How can nothing be hot? Photons don’t have mass so how can they store energy or be hot? Okay, so if we go one inch above a super hot star and there’s nothing there. Pamela: Well there’s light there. Fraser: Right there’s light there but there’s no mass there, right? What is the temperature? Pamela: This is where defining temperature is one of the most complicated things that you can do. You have the radiation temperature which is what is the energy stored in the light that’s coming out at you. An object of a characteristic temperature has a characteristic color. We can talk about that based on the primary color of light what is the temperature. It is more complicated than that. I probably made my quantum mechanics prof roll over with that one. There’s the energy that is stored in light. Light doesn’t have mass. It is actually pure energy. That’s all it is and when that energy hits something it can impart momentum. It can increase velocity which is part of the increasing momentum. If you hit something with enough light and are able to cool it off you can actually make it weigh more, give it more mass. Light itself we would say it isn’t coupled with the Higgs field and thus it doesn’t have any mass. At the same time it does have energy. That energy is the same thing as temperature. When we talk about temperature beyond talking about what color is the light we can also say how fast the atoms and a molecule vibrating are. We can say how fast an electron is moving through space. We can say all sorts of different things involving the motions of particles and how they’re colliding with walls. All of these different motions, vibrations and the light itself is all part of what defines temperature. Fraser: So is it kind of a nonsense question to ask? Temperature has to kind of go hand-in-hand with matter, right? If you stuck your thermometer out in front of a star it would heat up because the thermometer itself would heat up because of the photons that were imparting energy into the thermometer. If you had someway to have a thermometer that didn’t absorb energy somehow, ah. Pamela: But then it wouldn’t be a thermometer so now you’re changing your definitions. Fraser: Right, that’s all I’m saying. I’m saying that if there is no mass to be measured, the temperature to be measured of the matter then to ask what the temperature of that area is is kind of a nonsense question. Pamela: Not really because you can say so this energy, how much work could it do. There’s a matter of temperature is also a way of communicating energy, energy can do work. Energy can expand our universe. Fraser: Sure but there’s no way to see energy flowing past unless you interrupt it, right? Pamela: So now you’re asking does a tree in a forest make a sound if no one is there to hear it. Fraser: No, I guess what I’m saying is that if in the spaces in between atoms of hydrogen for example floating in the middle of space where there is no atoms at all, is there a temperature? If you measured the atoms you would say oh this space is very close to absolute zero. If you were trying to measure the not atoms in between those atoms would that give you an answer? Pamela: People who study interstellar media actually end up talking about many different types of temperature. You can have a cloud of gas that has a gas temperature and then the light passing through it from a star has its own characteristic temperature. You’re dealing with different temperatures also in some cases of different populations of particles. You could even say that puppies have a temperature based on their kinetic energy. If you have a room full of sleeping puppies that are being hit with infrared light to keep them warm and comfy the puppies have one temperature and the light has another temperature. Give the puppies food and a small child to invigorate them and the puppies now have a different temperature because of their kinetic energy, because of their motion. We talk about the motion and the collisions as one temperature. Then we also talk about the temperature of the radiation. It’s a complicated thing where there are mathematical definitions that allow there to be temperature even when there isn’t mass present. The cosmic microwave background is everywhere. That alone says everything has to be at least the temperature of the cosmic microwave background. Fraser: Terry asks: what can’t human eyes see in the color spectrum? Pamela: The best way to think of this is anything that has any light that doesn’t trigger a chemical response in your eye we can’t see. For us it is radio which is a good thing because if we could see all the cell phone signals, it would blind us. Imagine if every time your phone rang it was light having a floodlight go off. We don’t see radio, we don’t see infrared. We don’t see ultraviolet and we don’t see x-rays and gamma rays. The energies of those lights are wrong to trigger chemical reactions in our eyes and this is good. Fraser: So is there any part that we don’t see in between that color range? Say from red through blue, do we see everything in that range, invisible light? Pamela: Yeah, one of the nice convenient things about the eyes is the photoreceptors have overlapping sensitivities for the colors. We also have these light/no light sensors as well in our eyes. They simply go aha something off somewhere in this large frame of possible wavelengths hit me I’m going to trigger now. Fraser: Okay, moving on Chuck Hammond from Mount Pleasant, SC asks: how can we measure the rotational rates of the galaxies? Since galaxies are rotating so slowly many of our lifetimes, how can we actually measure the speed that they rotate? That’s a good question. I know the Milky Way takes 220 million years to rotate once on its axis. How could we wait for that to happen? Pamela: Luckily its Doppler shifts. When we look out specifically with the edge-on galaxies this is really easy. When you look out at an edge-on galaxy you can say the right side is moving toward me. You can measure how fast it is moving towards you by measuring the change in color of the lights of the stars. You then look at the left side of it and go aha that side is moving away from me. Measure its rate. What you usually find is there is also the center is moving at some rate so you have to subtract off the motion of the center toward and away from you. Once you make that correction for the fact that the whole galaxy is moving you can then get at the right side and the left side are moving forward and away from you which gives you the rate at which the whole system is rotating. Fraser: That sounds like a project that you might have to do in astronomy class. Pamela: Yeah, it’s actually something that a lot of small and large colleges have educational radio telescopes. You can do this by looking at the light from the gas in the discs of galaxies and just happily measure the rotation rates. Within our own Milky Way it allows you to look at the fact that we have lots of dark matter and things aren’t moving at the rate you think they should. Fraser: How do astronomers measure the rotational rate of the Milky Way since we’re in it? Pamela: Well here what we do is you look out and you have to look for stuff that is moving toward or away from you. Then you make corrections. Okay this has this angle relative to me and the center of the Milky Way and I measure it moving this way. You have to do lots of trig. You can do it, it’s not fun but you can do it. Once you build up all of the pieces of okay I’m looking at this crazy angle. I see this motion. I’m looking at this angle I see this motion. You can build up a distribution of how fast things are moving all the way around the Milky Way. You just look at things at different distances. Fraser: Do astronomers use the cosmic microwave background radiation for this? Pamela: We don’t use that to measure our rotation rate. Well, you can get there but it is much harder. The easiest way to get at how the whole Milky Way is moving versus just the sun is to only look at things within our Milky Way and measure their motion relative to us and do lots of corrections. When you’re trying to figure out the bulk motion of sun relative to center of galaxy’s sun relative to local group, galaxy versus local group you start measuring all of this relative to the cosmic microwave background. That’s really the best frame of reference that we can measure our motion relative to. Fraser: Alright, let’s move on. Chad asks: I’ve recently read some information on the thought that there was no dark energy and the reason we’re seeing red shift from supernovae is because we’re in a cosmic void. This would make more sense than dark energy but what evidence is there to suggest this is true? So, dark energy, mysterious force accelerating the expansion of the universe. The way that astronomers detected this was by measuring the distance to really distant supernovae and they found that the supernovae were further away than they should be if the expansion of the universe was just the leftover momentum from the big bang. So I guess the first question is when he says that we’re in a cosmic void what do you think he’s talking about? Pamela: One of the things that we talked about in our last episode on large scale structure was that overall the whole structure of the cosmos is one of walls and voids and junctions. We look like Swiss cheese. We look like very lacy mostly air Swiss cheese. The idea is that what we’re in is actually a collection of bubbles that are inside a much bigger bubble and that there are actually areas of much higher density beyond what we’re able to see. You can imagine that the entire visible part of the universe which is probably four percent of the universe or less depending on whose models you’re paying attention to is inside of a large empty space inside of a much greater cosmos. It is the fact that we’re an empty area surrounded by much higher masses is pulling the trail outward. The problem is that one of our basic premises in doing cosmology is that we don’t live in a special place. We don’t live in a special time. The only way this theory works is to assume that we’re in a very special location. There are a lot of people who are simply going no; we can’t even get there from here. It comes down to the fact that dark energy is very uncomfortable so what other explanations could there be. This is one of the ones that there could be but like I said it breaks the basic tenet of you can’t live in a special place. Fraser: So if we had a configuration of matter around us in such a way that it was accelerating our local group I guess in a way that would be different from the way every other galaxy out there is being accelerated then that would help explain it. Fraser: That violates this rule so I guess in the one case we say well we live in the most special place in the entire universe or [laughter] something weird is happening to everybody and we still just haven’t figured out what that is yet. Pamela: There’s always going to be someone out there trying to make us the center of everything. Fraser: Right. I guess that’s sort of what it is. It’s just like geocentricism; I don’t know local group. Let’s move on, Bob Able asks: what is our velocity in relation to the center of the galaxy? I know we travel approximately 18.5 miles per second around the sun but how fast are we moving around our own galaxy? I mentioned that before, right that we are orbiting the center of the galaxy. It takes us about 220 million years to complete an orbit. How fast are we going? Pamela: This is going to sound kind of sad but our motion relative to the center of the Milky Way relative to age A star has us with a tangential velocity. This means if you draw a straight line from the center of the galaxy to us and then draw a line at a right angle to that we’re moving at about ten kilometers per second. Fraser: So, less than what we’re traveling around the sun. Pamela: Yes but that’s our sun relative to the center of the Milky Way. So, we’re going around and around our sun and our sun is chugging along moving its way around the center of the galaxy. That chugging around the center of the galaxy is carrying us along at about ten kilometers per second. Fraser: Alright, well that gives us the answer. I think this is our last one, Shawn Irwin from Mesa, AZ asks: the Mickelson – Morely experiment failed to detect an aether of any sort, however if space were indeed a complete vacuum the speed of light should be without limit. So, what is it that limits of the speed of light? Pamela: Well there’s this original idea that in order for a wave to travel through space it has to have a medium in which to move. We’re used to seeing this with water. We’re used to this with sound. In the vacuum of space no one hears you scream. It’s one of those famous sci-fi lines. The thought was that in order for light which has wave-like characteristics to travel through space there has to be some sort of a medium for light to travel through. They looked and they couldn’t find it. No matter what people have done they can’t find the median that light is traveling through. So it really looks like light electromagnetic waves really don’t need anything. They just happily exist and move through a vacuum. This is a completely new way of thinking of things because what it says is you can have a wave that has a built in speed limit. It appears that within our universe there is a built in speed limit that’s just part of how space is defined. That’s the rate at which light moves in a vacuum. According to Einstein this is how we define time. This is how we define everything. In our universe there is a built in definition that says light shall and it does even when there’s no medium for the wave to move through. Fraser: When you ask what defines the speed of light, the speed of light is the speed of light and that’s all you can really say right now. Pamela: Two hundred and ninety-nine thousand seven hundred and ninety-two kilometers per second. It’s the law. Fraser: Alright. Well that’s it. I’m sure that bugs some people and they still are certain there’s some kind of aether but I know the [laughter] experimenters haven’t found anything like that. That’s it, that’s the law. Okay, thanks Pamela. I guess I’ll talk to you tomorrow for another show but to most people it will seem like it has been a few days.